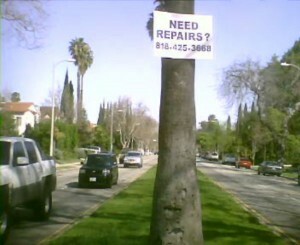 Couple weeks ago I posted on LA Metblogs about the irony of that “Need Repairs?” sign pictured at right (that I saw on my way to work), screwed there by some brainiac handyman so damagingly — not to mention unlawfully — high up the trunk of a palm tree in Hancock Park. But this wasn’t just any palm tree. It was one of all of those trees on the median of Highland Avenue between Wilshire and Melrose, which collectively make up Los Angeles Historic-Cultural Landmark No. 94. I wrote about calling the phone number on the sign, getting the person’s (his name is Jake) voicemail and leaving a message suggesting Mr. Fixit get back over from the 818 at his earliest opportunity and repair what he hath wrought. He ignored me, as I figured he would. So at the same time I contacted him I also filed a request with the Bureau of Street Services that the sign be removed. They fulfilled my request about a week later. The proprietor at Hopwood Construction may very well be one of the finest craftsmen around. 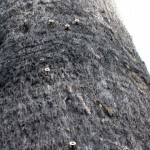 But unfortunately all that’s known is that he saw fit to promote his business by screwing a sign advertising his services into a Hancock Park palm tree, which is not only unlawful but also damaging to public property. In addition, he ignored a request to remove the sign, leaving it instead to our taxpayer dollars via the city’s Bureau of Street Services to do so more than a week later. As said, the level of quality of this person’s work is not something that can be spoken of here, but this sign and his unwillingness to remove it, is something that speaks volumes and such willful negligence should be taken into account if hiring this person becomes a consideration. Lastly while the sign was removed successfully by Bureau of Street Services personnel, they neglected to extract the seven ( seriously, seven!?) screws that held the sign to the tree, as you can see in the picture at left (click to enlargify). Though I pointed this out in the follow-up call I received advising the sign had been removed, I wasn’t given much hope that personnel would be in a rush to return any time soon and finish the job. So I expect that, while it might take a couple weeks, I’ll load my truck up with a ladder one of these Saturday or Sunday mornings and extract those bodies myself. Unless of course, Jake beats me to it. 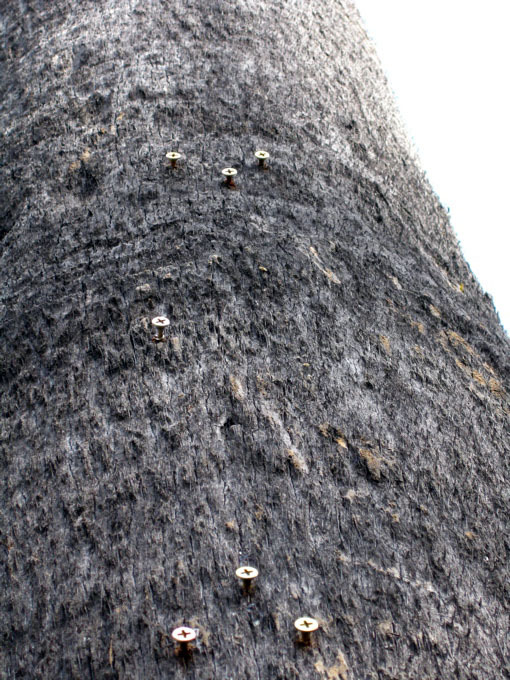 UPDATE (03.25): It crossed my mind that removing those and any other older screws embedded in the trunk might be detrimental to the tree’s health, leaving wounds that could potentially make it susceptible to infestation and disease. So I called the city’s Urban Forestry Division and spoke with a supervisor who advised that the only removals that could pose a threat would be those older foreign objects that the palm’s trunk has actually grown over. He said to leave those alone and just go after the screws and nails that are easily pried or screwed out without doing further damage to the trunk. This entry was posted on Wednesday, March 24th, 2010 at 8:53 pm and is filed under ads, commerce, crime, disgraceful, idiots. You can follow any responses to this entry through the RSS 2.0 feed. Both comments and pings are currently closed.